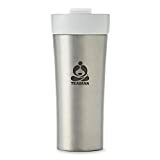 This modern tumbler has a double-walled porcelain interior sheathed in stainless steel. It comes complete with an infuser for brewing your favorite cup of tea at the office or on the go. Holds 12oz (350mL) of tea.